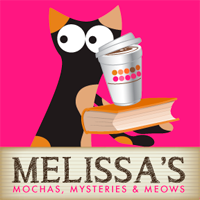 Melissa's Mochas, Mysteries and Meows: Gift a Gift. Help a Cat. What's better than a Christmas gift that also helps cats in need? We've rounded up some of our favorite ways to gift the animal lover in your life with something especially meaningful. Tabby's Place Christmas Virtual Gift Baskets. This is the coolest way to give someone a truly unique gift. You can choose gift baskets for diabetic cats, cats with heart disease, kittens, senior kitties, or special holiday-themed baskets. You make a donation in increments of $25 and choose your recipient. 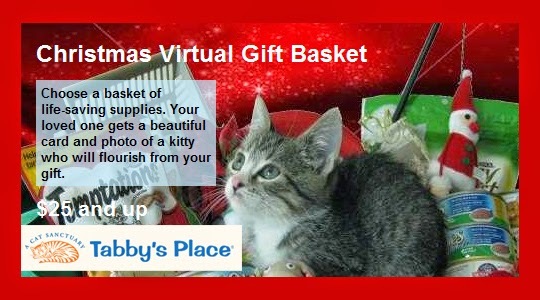 Tabby’s Place purchases the items for the cats and sends your loved one an e-card and/or a printed card. I'm especially partial to the baskets for cats with diabetes and heart disease. After dealing with both of these health issues with Tara, I know how expensive caring for these special needs kitties can be, so these baskets will really help cats who need some extra attention and special care. Tabby's Place Forgotten Felines have lived at Tabby's Place for 5+ years. Your recipient will receive monthly updates and photos about their sponsor kitty and the donation will go towards their food, litter, and vet time. Purrfect Pals Cat Sponsorship Holiday Greeting Cards. Purrfect Pals is home to nearly 300 cats who have nowhere else to go. These are cats who have tested positive for FIV or feline leukemia, cats with behavioral issues, feral cats, geriatric cats, and cats with diabetes or other long-term health issues. All live in colonies in a clean, comfortable, cat-oriented environment, receiving regular veterinary care. Your $25 donation pays for a month of care for one of these cats, brightening the holiday season at Purrfect Pals. Choose the card or cards you’d like, and they will mail it to you with an included envelope to make a wonderful gift. 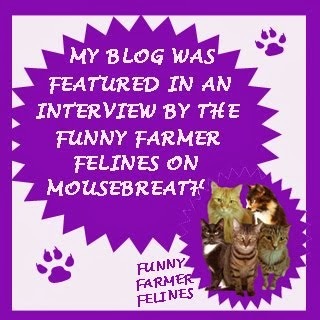 Each card tells a little bit about Purrfect Pals and has the cat’s story. 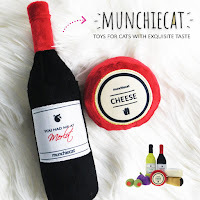 Feed a Cat for Christmas. One amazing lady named Janine feeds over 70 homeless cats in the most underserved parts of Rochester, NY. These sweet souls have been cast off, left behind, abandoned. Often, they are hurting. Always, they are hungry. 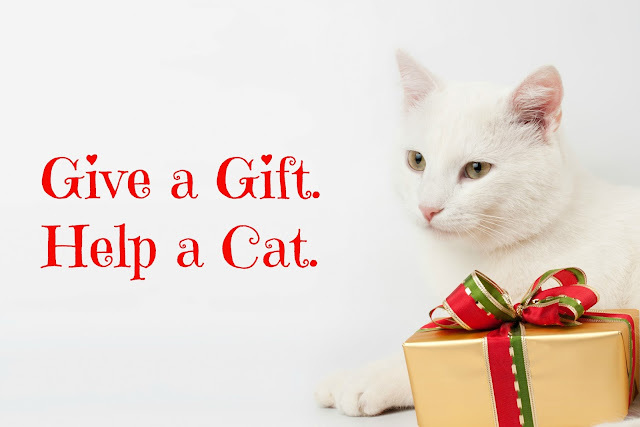 This December, for $40, you can partner with her and Feed a Cat for Christmas. 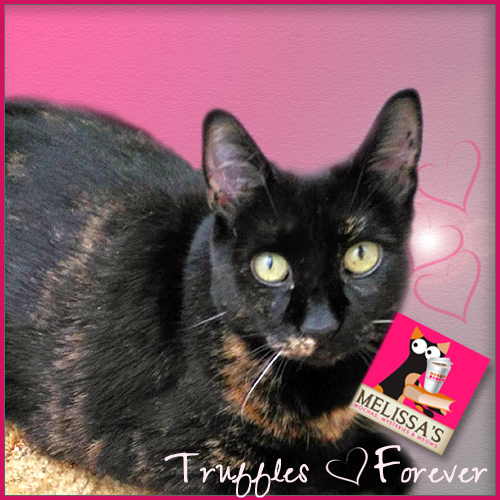 Sponsor food for these kitties for just one day--as a gift, just because, or in honor or memory of a special person or pet. 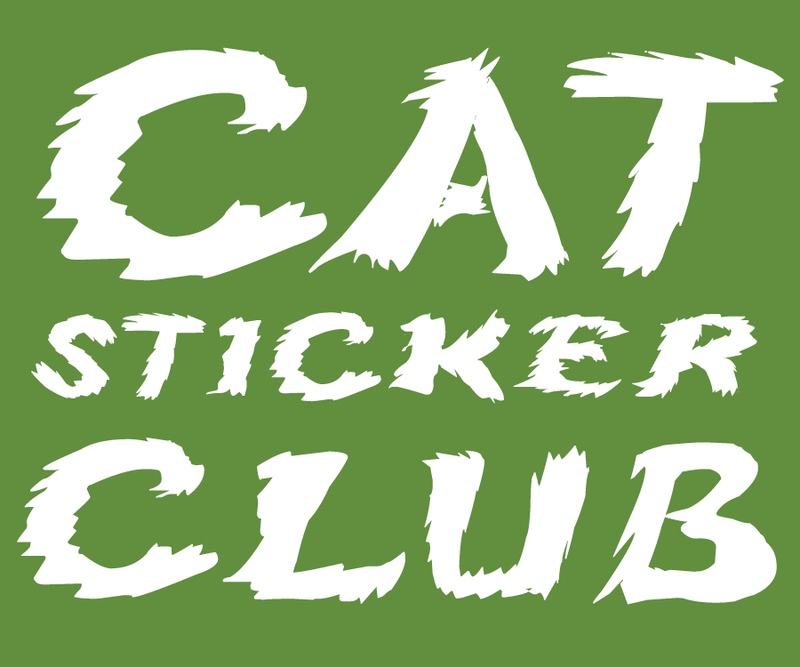 In return, you'll receive a certificate and the kitties' eternal gratitude! 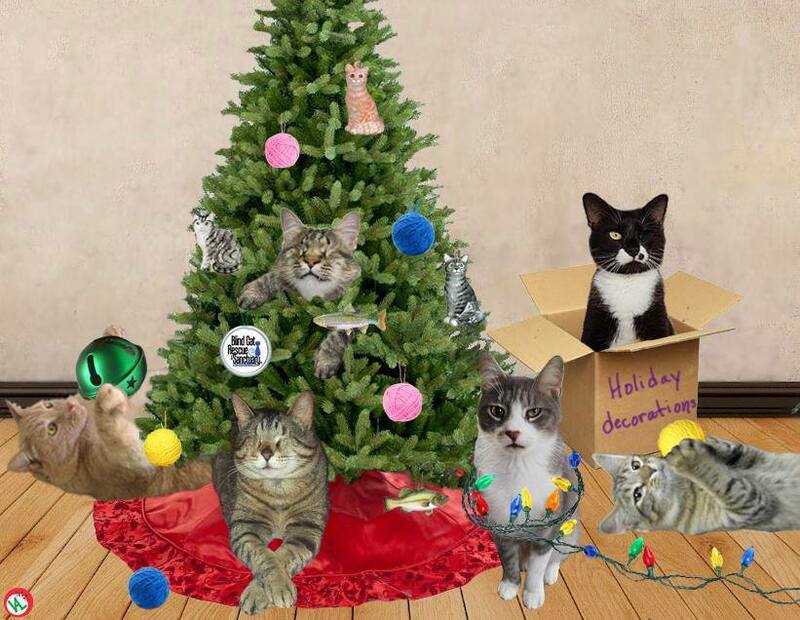 Decorate the Blind Cat Rescue & Sanctuary Virtual Christmas Tree. Lights and gift boxes will make the tree beautiful and different dollar donations will let you help trim the tree! For all gift donations of $10 or more, a gift card will be sent to the recipient. Your message will also be posted under the Christmas tree on the BCR website. 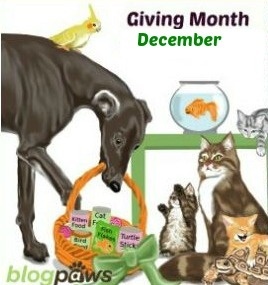 It's a month for giving! 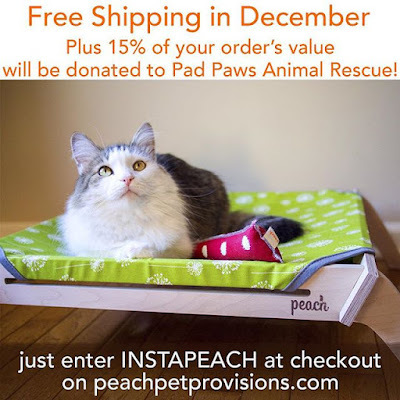 Do you know of any other unique gift ideas that also help animals in need? Tell us about it in the comments! I like to focus on local first. Find the closest shelter and donate to their wishlist or volunteer. Many communities have pet food pantries as well. Most best known, well-managed shelters are well-funded and operate in the black. Check charity navigator to find out who is the best fit. We didn't know about these. Nice options! Layla is right, it's great to check and see if there's local rescue who needs help, too. 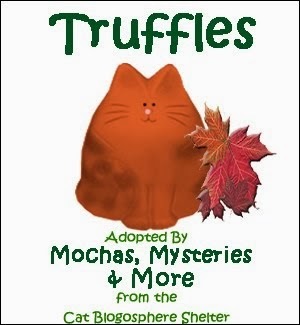 Our local rescues are really slow about acknowledging gifts "in honor of," so it's nice to have ability to do that for the upcoming holidays, and it's nice to know that Tabby's Place can make this available. wow, these all sound like great places to help. Tabby's place is our very favorite. I will have to come back and look them all over more carefully. This is a great post about all of them. Nothing better than giving at Christmas time or anytime. Thanks for letting us know about these ways to help the animals. We usually donate to our local shelters and rescues. What great, thoughtful gift ideas! I will definitely be looking into these. This year I'm also putting together food and toy baskets for two of our local animal shelters. I hate to think of any cats and dogs being without a furever home on Christmas, so I like to do even what little I can to help them make it a special day. Thank you for sharing these reviews of such great causes! I help out the local animal shelter. We gave kitties gifts at Bideawee yesterday. It’s so nice that so many are doing so much for homeless kitties.